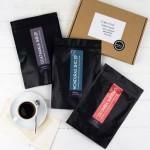 A coffee subscription gift which is delivered in letterbox friendly packaging and in a brew method of your choice. As soon as Novello receives your order, they will start to prepare the coffee, it's that fresh. Each month (for 3 or 6 months) Novello selects a different single origin coffee for you or your lucky recipient to try. For month one, a welcome letter is sent alongside the coffee and for each month thereafter, information about origin, production process and tasting notes is included. Be the first person to tell us what you think about Novello Coffee and you'll save £2.50 on your next purchase!